Salvador Dali, Corpus Hypercubus, oil on canvas, 29" by 23", 1954. Rand's favorite painting - she spent hours contemplating it at the Metropolitan Musuem of art. She even felt a kinship between her personal view of John Galt's defiance over his torture in Atlas Shrugged and Dali's depiction of the suffering of Jesus. Thanks for posting it, Michael! Dali is one of my favorite artists. His imagination and rendering skills are incredible. I've read that he paints his dreams and subconscious and was facinated by Freud's work. There was a little exercise he did to see his subconscious. He would doze off in a chair with a key or other object in his hand and a cup or something on the floor next to his chair. When he dozed off the key would fall into the cup and awaken him from a dream. Then he would paint. Anyway, I'm actually rather surprised that this would be one of Ayn Rand's favorite paintings. I wouldn't expect her to like Dali's sense of life and to be dismissive of his work. I don't get the message of suffering from this image at all, just a mystical dude performing magic tricks. Levitation, baby. Yeah. I'm not such a fan of Dali. For me paintings in general belong to one of two categories: 1. those which are in reality much better than you'd guess from a reproduction, 2. those where seeing the real thing is a disappointment after having seen it on a reproduction. Dali belongs for me definitely to the second category. There was a large exhibition in Rotterdam in 1970/1971 (it happens that this year there will another great Dali exhibition in Rotterdam) and there I saw for the first time many of his works I'd until then only known from reproductions. I was especially disappointed at his much-praised painting technique, it was not as good as I'd thought. I think that some of the reasons that he's so popular are the theatrical quality of his work and the surrealistic elements, and these do well on a reproduction. I'm not so fond of all those gimmicks, however. That's also the reason that I don't like Magritte, it's all gimmicks and his technique is even worse than that of Dali. In contrast I've always been struck by the paintings of the old Dutch masters, they're in reality incredibly more beautiful than on the best reproduction, and their technique is fantastic. About Dali: I remember having read an essay by Orwell about him that was highly critical. I'll have to look it up again for the details. On looking at this painting and trying to imagine Rand looking at it for hours, the idea of her "man worship" takes on a very concrete meaning that it did not have before in my mind. She meant the literal worship of man, and "worship" not a metaphor. In the painting, Mary is much smaller than Jesus, she is obviously worshiping him, and Jesus is not physically mutilated - he is whole and held up for the whole world to see. Since the cross is a modern-looking backdrop and Jesus is suspended in midair in front of it, I can see how she would equate the cross with altruism and how the "invisible" force of ideas can crucify humanity's best men. I get an incredibly poignant array of mixed emotions on trying to see this painting as Rand did. 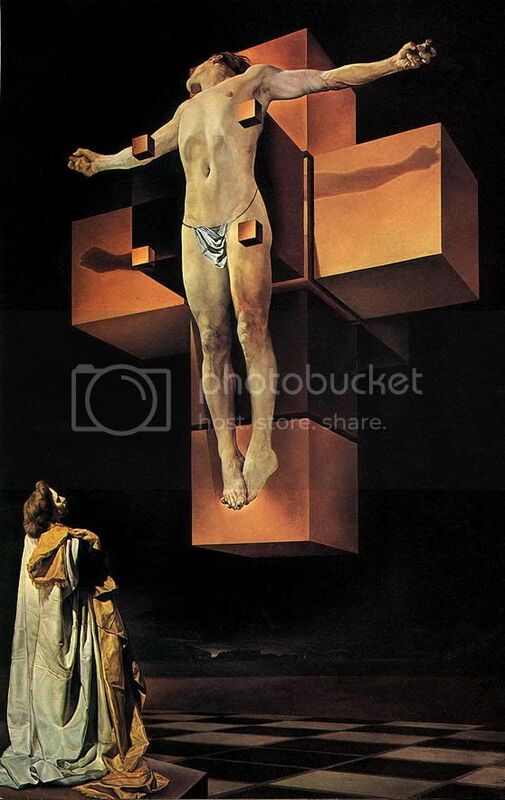 The gimmick in this painting is the cross, which is an unfolding (a "net") in 3-dimensional space of a tesseract (4-dimensional hypercube - which explains the title of the painting). Compare with the unfolding of a 3-dimensional cube into a flat cross of 6 squares (1,3,1,1). There is an amusing story by Heinlein "And He Built a Crooked House" in which someone built a house in the form of a net of a tesseract. There is an earthquake, with the result that the house "collapses" into a real 4-dimensional hypercube, with all its confusing and amusing implications. This is indeed an impressive painting. I saw it yesterday at the Metropolitan Museum of Art. The way Dali captures details of the human form is terrific. Mary is portrayed by Dali's wife, Gala, believe. I was once inspired to write a poem about this painting. Good golly, Mr. Dali, let's hear your poem, John! You know you've got us in suspense!! 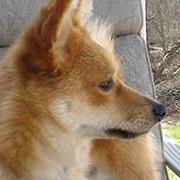 The agony he must endure this day. The woman who is watching does not pray. And yet, she worships, with a glance austere. Can shake the awe which holds her in his sway. Of his mind's might, which does not choose to die. But, tremblingly, a light shines in the distance. Thank your for that lovely set of lines. I like the tension in this poem from the rhyme scheme (on first read, you don't know where the rhymes will fall, which is typical of abba on first read, and even once you do know where, the last six lines fool you by not keeping the abba pattern, nor even the same abb pattern in the first half - yet clear rhymes are kept, subconsciously indicating that there is method to the madness). This tension is good because of the painful nature of the subject and the striving to rise above it. Yes, when I dug up the poem and read it, those lines about austere worship did immediately put me in mind of Rand and some of the comments about her worshipful attitudes earlier in the thread. It was written sometime in the seventies. The rhyme scheme does keep you guessing somehow. John, thank you for sharing that with us. I enjoyed your sonnet very much. It was a sonnet, wasn't it? I noticed almost immediately that you were using iambic pentameter, and you gracefully held to it until in the second grouping of verses, when you used the "ence" rhyme. You are a very skillful, expressive poet. Wow! John, as someone who loves poetry (and art), this is a great and insightful poem, perfectly balanced and written, with emotion under the surface, and expressing important aspects of what it means to be human and to have stature. Totally independent of any religion. It deserves to be widely seen and associated with this painting. Not only is it powerful standing alone, but I had not fully liked and appreciated the painting until I read your poem. Each of these had -completely- escaped me, because I had not fully studied the painting: the full meaning of what the two of them are doing, and feeling, and choosing & the significance of the glimmer of light in the distance. Roger, thank you. Yes, it's a sonnet. The "istence" rhymes definitely change the metrical feel by adding an unaccented syllable at the ends of those lines. But in traditional terms, it's still iambic pentameter but with a feminine rhyme. Of course, in a reading, you would not sound out the beats exactly this way. But that's what I think of as the underlying meter. I've noticed that I have a tendency get a little bit irregular near the end, and then go regular again in the last line. Phil, thank you. I've done a number of poems about paintings, and one of my regrets in publishing the poems is that they usually aren't accompanied by a nice full-color reproduction of the paintings in question! Poems about paintings are a modern tradition, but it really helps to see them together, since the relationship is symbiotic. Thanks for that wonderful poem, John. I think it is a great idea to have poems for paintings. I even tried that a few weeks ago with the Surfside painting, but I am not a writer and certainly not a poet. I was just having fun. Putting poems to paintings enhances both the painting and the poetry. I love seeing this type of creativity on Objectivist Living. If you or anyone has a poem about a famous work, by all means put it up in the Rational Galleries. I can find, fix and size the artwork in Photoshop if needed. I would love to see Painting-n-Poems as a regular feature here. I imagine gathering around the fireplace with a group of friends once in a while and having a new painting hanging above the mantle and people take turns writing and reading their poetry about the artwork. That would be a wonderful way to spend an evening. Unfortunately, I have neither a fireplace or all that artwork at my disposal so we'll just have to sort of do it virtually. Dragonfly, Reading your post about 'tesseract' reminded me of a book I read long ago as a kid: 'A Wrinkle In Time'. In it there is some 'tessering' going on which allows people to cross light years nearly instantaneously (obviously science fiction). Rereading it now as an adult is a different experience. At any rate, I wonder if Dali was using the hypercube as a symbol of science, rather than altruism. P.S. For you literary types: The first sentence in the book was'It was a dark and stormy night.' Not sure if that is where the Peanuts character Snoopy got his inspiration or not. "You," he hissed, stretching and cruelly contorting the word in a tone of voice his mother would have forbade him to address her in, but with an added shrillness not unlike the lunatic ravings of a madman denied a second serving of soup, which caused his words to well up bileously from his gravelly larynx and charge past his quivering, sweaty lips which he had, for added melodrama, snarled into a maniacal grimace, "are a liar." It was a warm, rank odor that hit Detective Swatworth's nostrils, breaking into components that seemed hauntingly familiar, reminiscent of dangerous deeds past, lighting up every wary fiber in his torso, warning him to be wary of what lay ahead, on guard, finger on the trigger, then relaxed again as he realized it was coming from his own armpit. It had started off as a prank, but when Major Elyse Livesay discovered (during her solo space walk, no less!) the tarantula that the boys in the crew had slipped into her spacesuit, she knew that while in space no one could hear you scream, it was damn sure not for lack of trying. Hermann lay with Esmerelda, entwined with one another among love-tangled sheets and he thought how this one constant yet mercurial woman was one whom he could hold in his arms forever, although eventually he'd have to get up to go to the bathroom. As he gazed over at his aged and sickly wife lying at his side, he remembered the woman he had once known - the vibrant exciting beauty with a heart of gold and a head full of dreams - and instantly wished he had married her instead. "All rise," said the Judge of The Company vs. Workers' Comp., "except for those with tendonitis, eyestrain, headaches, neck pain, pinched nerves, carpal tunnel syndrome, repetitive stress injuries, lumbosacral sprain, ruptured disks, temporomandibular joint pain, chronic fatigue syndrome, traumatic brain injuries, Axis II mental disorders, smoke inhalation, amputations, electrocutions, Gulf War Syndrome, Agent Orange exposure, anthrax poisoning, or pneumonoultramicroscopicsilicovolcanoconiosis," leaving only the two Workers' Comp. lawyers standing in the courtroom, looking sheepishly at their feet. "If I may beg your pardon, my dear lady, I happened to catch your eye from across the room and I was entranced by the beauty therein, the pure and unveiled light of honesty flashing bravely at me, the sweet coyness couched in the depths of your green iris like a dolphin in the sea, the smooth marble of your soul in my hand which drew me hither to you," said the dark stranger, returning the glass orb to his hostess, who gratefully popped it back in place with a soft sucking sound. I had heard of that contest, this is the first I've seen the entries. The first one does seem a little objectivist doesn't it? By the way, you are one of the few people I've read who have remarked on the difference between seeing a reproduction and seeing it in person. I can remember my trip to the Louvre where suddenly some of my favorites were severely downgraded. The Mona Lisa, if you can see past the people and plastic is actually better, so is Velasquez, Vermeer, who else do you think? I saw a painting a number of years ago that I fell in love with, but I have never been able to find a reproduction of it or learn who the painter was. I'll describe it, in the hope that one of you may be familiar with it. I was in Granada, Spain, in a small gallery that was, as I recall, in the basement of a church. The painting was of Christ on the cross. His body was twisted, contorted in agony -- but the head and face were emerging into sunlight, and the face held as ecstatic an expression as I have ever seen. One knew that he was dying in fearful pain, but that the pain no longer had the power to touch his spirit -- because he was looking into the face of God. The room was not well lit, and I could not make out the name of the painter. Does anyone know this painting? Do you know if you were looking at an original or a print? Was it anything like these?